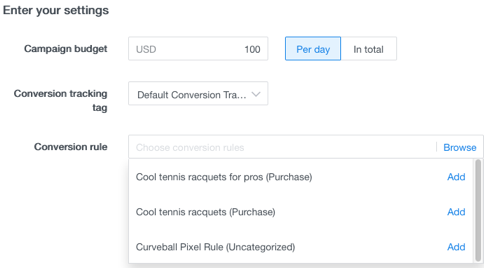 If you’ve created conversion rules for your campaigns, you can select one or more of these rules from an entire list available at the advertiser level. 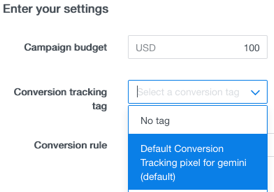 You simply click the Show advanced settings item from the Enter your settings section of the Create new campaign dialog and enter your conversion tracking tag and browse from a list of conversion rules. Conversion tracking is a great way to determine if your campaign is working and how effective it is. You can then measure and optimize your campaign’s performance. Create a Conversion Rule to Increase Website Traffic. Track Conversions on Your Website. You create a conversion rule with a name and category, adding a default value and specifying the URL of your conversion web page. You then place a code snippet - a conversion tracking tag - on your website. This code snippet informs you when a user has reached the conversion page or taken an action on your web page. In the Choose your campaign objective dialog, click Select for the type of campaign you want, either Visit my website or Know my brand. Once the Create new campaign dialog appears, complete the information required in the fields for your campaign, like name. Scroll down the page and in the Enter your settings section, specify the amount for your Campaign budget in USD, per day. Now select and click the Show advanced settings item. Select or enter your Conversion tracking tag. You can use the Default Conversion Tracking pixel for gemini. In the Conversion rule field, you can browse from a list of conversion rules you’ve already created and Add those rules to your campaign. You can only add existing rules, but not create new ones. If no rules are selected, your campaign will report and optimize against all rules. If some rules are selected, the campaign will report and optimize against the selection. Once you’ve completed this, click Start campaign at the bottom of the page.